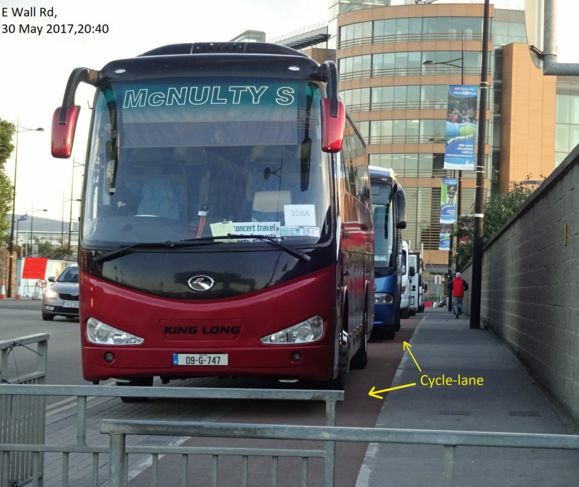 Coach parking on the footpath and cycle path outside the 3Arena and along East Wall Road was not approved by Dublin City Council or the Garda Divisional Traffic Corps and Event Management Office. The images, taken by a reader, were taken on May 30, when singer/songwriter Shawn Mendes was performing at the 3Arena. As we reported last year, the segregated cycle route on the Alfie Byrne Road were “suspended” for Bruce Springsteen’s Croke Park concerts. These coach drivers are doing extreme damage to the pavement structure: footpath and cycle track pavements are constructed a lot thinner than roads and so are very easily destroyed by large commercial vehicles. What we will end up with here is an uneven and potholed cycle track than will never be resurfaced like all the other damaged cycle tracks in the city. Does anybody know of a cycle track that has ever been resurfaced? Anyway good to be highlighting this illegal parking – cyclists need to protect what little they’ve got! Did the photographer not think of calling the police to at least ticket the vehicles? Have the Corpo or the Gardaí given permission for the end of road works sign to block the same cycle lane, as illustrated in the final photograph?